How much bandwidth does the mobile ham really need? Like most questions, there are several answers to this. The best one probably being "it depends on your lifestyle". If you are used to broadband internet access and don't want to give that up when you are en route, you are a potential candidate for internet access via satellite, and you will have to bear the cost of that luxury. If on the other hand you are en route to relax, and you don't need instant information, you could try PSKmail for bare bones information delivery. Pskmail gives you a 500 Hz wide channel to the internet. This is enough to get the most important email, the weather forecast and the daily update on the sunspots. Being nomadic, we live on a boat during summer and in a camper during winter, I get by with 200 Hz and a half hour session with the server most of the time. How much email do you really need daily to keep up to date? Of course we combine daily PSKmail with a webmail session once a week, to get the 'picture ' if you know what I mean. And to get the non-ham stuff. But I can upload software patches to the internet on a daily basis while living on a Mediterranean beach which does not have a ADSL socket. 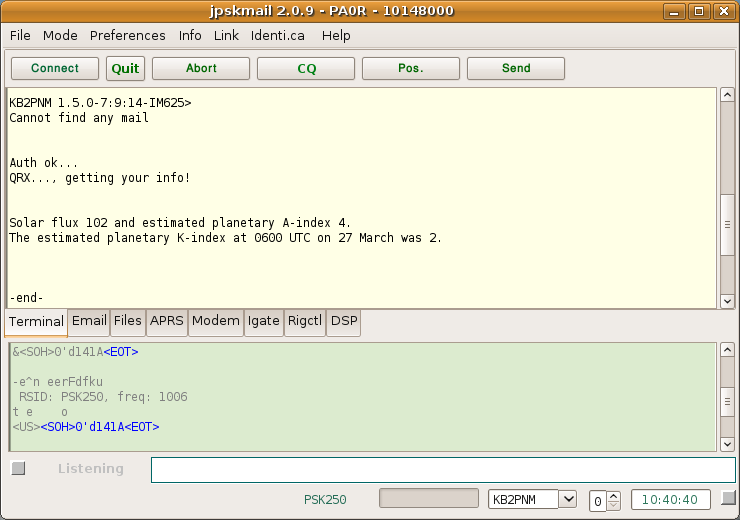 PSKmail is a narrow band arq system for use by amateur radio hams via short wave (HF) communication. It does not use a special controller, you just need a computer with a sound card. The PSKmail server uses the fldigi program as a modem, and can use PSK, MFSK and THOR modes, including the new robust PSK modes which include soft viterbi decoding and interleave to increase immunity to qrm and qrn. The client is written in java, and has the modems built in. The operator can choose several modes and speeds when starting a connection, to match channel conditions. The system uses asymmetric adaptive mode control to use the channel capacity efficiently. When channel quality changes during a connected session the system changes speed to accommodate the new circumstances. PSKmail has a client/server architecture. Unlike Packet Radio the PSKmail protocol only allows 1 connected client at the time. Bandwidth (3dB) using the maximum speed (PSK500) is max. 500 Hz, providing a net throughput of ~2600 characters/minute including ARQ overhead. The multiplatform PSKmail client runs on windows, linux and OSX. The server is written in perl. Applications include a Mailbox (port 24) allowing down/upload of local mail and mail from the internet, downloading information from the web (ASCII text only), position update and station-to-station messaging via APRS(port26), and chat mode (between clients). For this special use case, pskmail contains a port where you can connect your APRS map application (xastir, UIview). Pskmail also works together with Sylpheed and other Linux mail clients. You can use the mail integrator you are used to (any mbox compatible system). The main backbone frequency in Europe is 10148.0 kHz (10147.0 dial, USB). Default listening mode in EU is PSK500R. The pskmail project was started in 2005 by PA0R, soon joined by SM0RWO, and IS0GRB. Until end of 2008 the client was only available for Linux, the java client started early 2009 and has now taken over from the perl client, so that pskmail is now compatible with all common operating systems. VK2ETA joined the team in 2009, with valuable contributions regarding robust psk modes for fldigi. John also did most of the work for the translation of the modem code from C++ to java. The work on the mainstream client focuses on transfer of email and web info in connected mode. The software is free and open source, licenced under GPL. This WIKI contains information on how to install and operate the mainstream pskmail system. to buy PA0R a beer whenever appropriate. 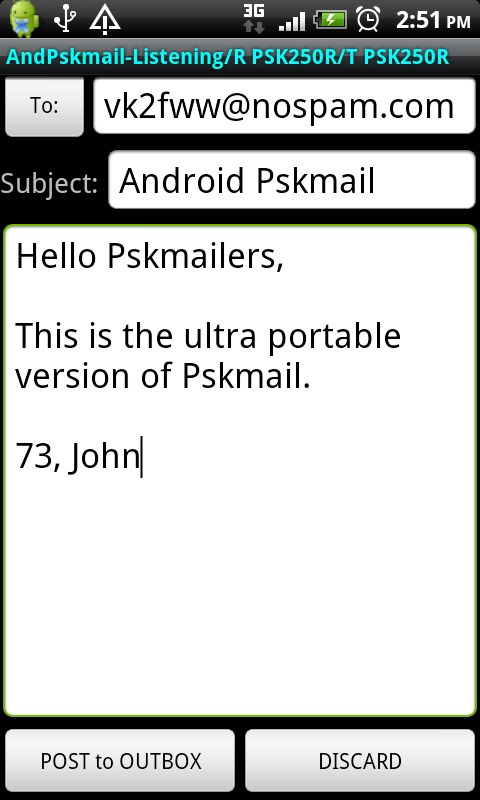 Code update for PSKmail on the Android Operating system by John, VK2ETA. The main objective of this development is to provide an ultra-portable, as in backpack or bicycle for example, Pskmail client solution, which can run on an Android phone or tablet.